There’s a singular moment in the mid 80’s movie Out of Africa that’s always stuck with me. I'm not certain if Karen Blixen ever really did it, if she and Denys Finch Hatton flew a small plane over a shallow African lake thronged with brilliant pink flamingos, but this memorable bit of moviemaking made me hunger for a similar experience. On my first trip to Kenya, I vowed to duplicate the trip. But with little time and no idea how to arrange such a trip, I had to rely on memories of the movie and my imagination. On my second trip, though, my cousin Dan arranged for a plane to fly friends and me to the lake—though he made it clear that he found the movie sappy and stupid. 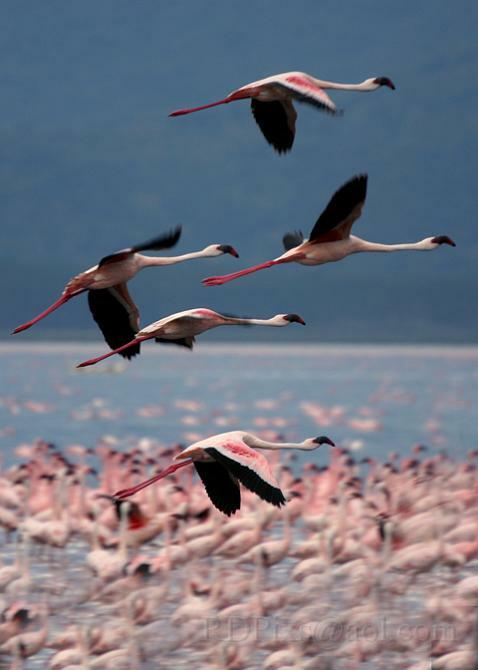 Lakes Bogoria and Nakuru—shallow soda lakes that serve as a wading pool for literally millions of lesser and greater pink flamingos—sit in the middle of the Great Rift Valley, the birthplace of man that cuts vertically and deeply across eastern Africa. The lakes can be reached via treacherous “roads” from Nairobi, but for purposes of recreating the movie scene, I needed to visit via plane. In this former British colony, pilots for hire are seemingly as plentiful as wildebeests on the Serengeti. The country’s pilots are part Han Solo, part Indiana Jones. Some will take you on a deluxe tour, a roller coaster ride in the sky, with the great plains, Rift Valley, or coastal beaches of Kenya spread beneath you. I was interested in doing a flyover of Lake Bogoria, where the locals told me that upwards of two million flamingos were congregating and feeding on the abundant algae that grow in the alkaline-rich soda lakes. (It’s funny how Kenyans seem to know about these things: the weather on the coast, whether elephants are around and in which lake the highly social flamingos are congregating). 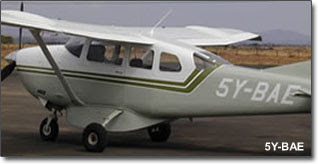 Dan made arrangements with a Tropic Air pilot named Buddy who was of broad grin, leathery skin, and a winning beer gut that barely fit beneath the plane's steering wheel. Immediately after take-off, Buddy banked the plane and we passed directly over a perturbed herd of dusty elephants which pointed their trunks toward the sky. Instead of gaining altitude, we stayed low to the ground—probably between 50 and 100 feet. Heading west across grassy, acacia-dotted plains, I watched small herds of goats scatter. Zebra, giraffe, impala and ostrich raced across the grasslands below, stirring up clouds of red dust. The windows remained open, allowing the grassy rich smell of the equatorial highlands to sweep through the plane. Buddy steered the plane into a near dive as we head into a deep, narrow gorge that took us all the way down to the bottom of the Rift. I feared for my life, wondering if one of the strong currents racing down the gorge would smash us into one of the rock walls, but he rode the waves as if he were surfing. Nothing prepared me for my first glimpse of Lake Bogoria. At first, the light-colored band along the edges nearest appeared to be beaches, but as we flew closer, small bands of white along the lakeshore became large swaths of pulsating, flying and wading pink birds. In every direction there was activity. Birds wading, birds swimming, birds flying toward the center of the lake, birds flying toward shore, birds congregating on shore and birds scurrying in all directions—all a vibrant pink that contrasted sharply with the bleached out, dun color of the desert-like, volcanic ridges that cupped the lakes. Just a few million Greater and Lesser Flamingos, an occasional eagle, and our small plane—oh, and as I was to find out, some swifts. As we glided along the shoreline, peering at the vista below, there was a sudden thud on the right wing. I waited for us to begin falling from the sky. Once I was assured we weren’t going to plunge to the ground, I was able to enjoy the ride again. We followed the shore line of the cigar-shaped lake to its southern terminus and then Buddy banked the plane toward the eastern shore which was packed with more of the brightly colored birds. Here, sulfurous fumes from the springs and geysers far below crept through the cabin while rivulets of steam rose from the black volcanic rock. Flamingos flew in every direction and glided above the dark waters of the lake with wingspans that seemed as wide as our plane’s. Flanking the lake’s eastern shore, the rocky, serrate escarpment that rises abruptly from the dark waters of Bogoria forms the arid, western extent of the mythical Aberdares (where Hemingway and the Price of Wales hunted) and resembles a lunar landscape. We circle the lake a few times, but I never tired of watching the birds and the spectacle they created en masse: the unreal splotches of muted and dusty pink from a distance, and the constantly-moving, pulsating blobs and clusters of vibrant rose, cerise, and coral directly below us. I struggled to compare the spectacle to something familiar, to some experience or something I’d seen somewhere. Sure it was familiar to me from the scene in Out of Africa that brought me there, after all. But as if often the case with movies, even an image projected onto a surface 35 feet wide and drenched in color can’t adequately capture the feel and look of the real thing. You might be tempted to think of the lake as a giant bee hive—albeit occupied by giant pink, graceful birds—but, as we rode the air currents above the primeval body of water, I decided it resembled a school of tropical fish as much as the skies above a busy airport. In the end, I realized that such a spectacle of nature can’t really be compared to some fish or an airport. The lake really can’t be compared to anything at all. When Buddy dropped my friends and me back at the airstrip, it was as if the movie had ended and the house lights had been raised. I was still trying to digest what I’d seen as the plane buzzed us before heading off to the south and Nairobi. Though my feet were planted firmly on the red Kenyan soil, I felt as if I were still flying. Every city has its overrun tourist destinations. New York has the Empire State, Rome the Colosseum, and Sydney its opera house. And after these iconic sites exist a bunch of next-tier, but often similarly-overrun spots. While many travelers choose to avoid such attractions, some find enough authenticity in the spots to make them worth a visit. Paris’ Café Deux Magots, one of the City of Light’s famous and historic cafés, is just such a place. During a recent reading of Julia Child's biography, I was reminded of the Latin Quarter standby. Like the famous American chef, I consider the Left Bank café a favorite. Child, who visited the café on her first Saturday in Paris, admired the morning sun striking the chimneypots of the city’s grand apartment houses while she and her husband ate buttery croissants and drank café complet. Many tourists visit the institution for its history: Hemingway, Sartre, and hundreds of writers, artists, poets and glitterati sipped a coffee, wine or beer at one of the small wooden tables in the high ceilinged rooms indoors—under the sage gaze of two Eastern Magi statues—or al fresco at one of the even tinier sidewalk tables in traditional wicker café chairs. Deux Magots has changed little since it opened in 1914, though its prices no longer allow for many struggling artists to visit. If you balk at paying inflated prices for breakfast, consider that your check includes entry to a historic destination as well an amusement park ride for adults. And unlike the rides at Six Flags, the experience here lasts as long as you’d like—you can sit at your table and sip your coffee or wine for twenty minutes or two hours. And then there’s the food—the incomparable croissants and baguettes, the pastries, the eggs, but most of all, the coffee. Order it plain, as an espresso, au lait or a cappuccino and whatever you sip will rock your world. Café-sitting in the Left Bank offers manifold pleasures. The world comes to Paris but the city seemingly could care less as its citizens ebb and flow along its streets like colorful, ever-shifting tides. Sure, you might see a movie star stroll past, but the real pleasure is observing life. Sip a flavorful coffee and catch a glimpse of a dead ringer for Catherine Deneuve being led by three French bulldogs on the sidewalk and suddenly, eighteen euro for a continental breakfast seems a bargain.